Much of my programming experience has been gained through trial and error. For a teenager doing raw frontend development, this is not a totally terrible strategy. In fact, if you have the patience to nudge a box a few pixels over and over then eyeball it in different platforms and sizes to see what looks best, being a frontend dev might be for you. However, for things that can't be eyeballed, and with a large framework like Ember, that kind of manual plugging takes forever. For a while, I was honestly just Googling my problems and trying everything that Stack Overflow was suggesting one by one. But if it's 3 a.m. and you barely have enough functioning brain cells to maintain your sanity, much less keep track of which things worked, you can't do this. So what I've started to do is keep a dev diary. Much like a real diary, this helps me organize my thoughts so I can sleep at night without trying to keep anything in my head, then return to the task in the morning without having forgotten what I've already done. 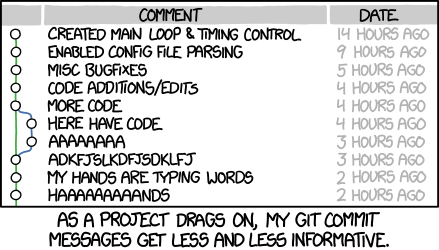 There's also the added bonus of having a beautiful written record of the knowledge I've gained, instead of a bunch of uninformative git commits called "Still broken", "Less broken", "Fixed this, now trying to fix this other thing", and "OMG WTF". I highly recommend it.